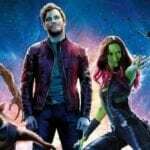 Starring John Boyega, Scott Eastwood, Cailee Spaeny, Charlie Day, Rinko Kikuchi, Burn Gorman, Jing Tian, Zhang Jin, Adria Arjona, Karan Brar, Ivanna Sakhno, Shyrley Rodríguez, Levi Meaden, Rahart Adams, Zhu Zhu, Wesley Wong, Lily Ji, and Mackenyu. One common assumption regarding sequels is that they are never as good as the first one. Every now and then a sequel comes along that puts that assumption to the test by trying to deliver something different, but more often than not fails. 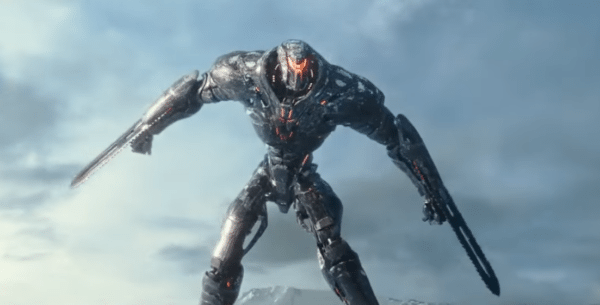 Pacific Rim Uprising falls into that category as it strives to bring something original with its vision, yet ultimately doesn’t do enough to separate it from the first film. Taking over from Guillermo del Toro, director Steven DeKnight makes his directorial debut and retains most of del Toro’s style from Pacific Rim as well as the enjoyment of the movie itself. 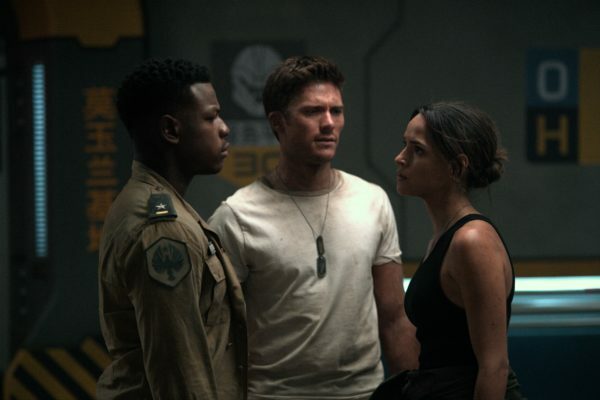 Much like its predecessor, Pacific Rim Uprising doesn’t take itself too seriously in several aspects, from its action, writing to even the actor’s portrayals. However, whereas there was still a lot of memorable performances and scenes from the first film, this one doesn’t have nearly the same amount of magic. Everything is somewhat lackluster compared to the first film. I will give credit, however, to the film’s plot. Pacific Rim‘s basic premise was monsters invading the world and humanity creating giant robots to fight them and ran with it. Uprising is entirely different in that there’s an actual plot to the film with several layers going on. It tries to elevate the first film’s premise by incorporating several aspects to it, but this where my credit ends. The plot takes a little while to get going and unfortunately just doesn’t hold up due to characters disappearing for several scenes and their motivations not getting enough depth. Granted, this is a Pacific Rim film we’re talking about, but if its going to have a plot it should at least be able to hold its own weight. John Boyega does make a great lead as Jake Pentacost, the son of Idris Elba’s Stacker Pentacost from the original. He does carry a lot of the film’s drama and has good comedic timing, though some of his jokes fall flat. He’s not quite as memorable as Charlie Hunnam, but still does well with what he’s given. Scott Eastwood, however, doesn’t succeed quite as well. A combination of his lines and his delivery of them doesn’t help his character stand out from the pack. His chemistry with Boyega is good enough, though at several points it felt like the history that existed between their characters wasn’t there. There is also a strange love triangle between them and Adria Arjona’s Jules, a plotline that serves no purpose, is never given any real weight and never comes close to resolved. There are some returning cast from the original as well. Charlie Day returns as Dr. Newt Geiszler, giving a much more toned down performance than he did previously, as well as his lab partner Dr. Hermann Gottlieb, played by Burn Gorman. Between the two, Gorman gets more screentime and a significantly bigger role than the first film while Day spends most of his time on the corporate side of Jaeger production, largely separated from the main players. Rinko Kikuchi also has a small role as Mako Mori, but the brother/sister relationship between her and Boyega just isn’t there. The rest of the cast is instantly forgettable. Made up of a group of young Jaeger cadets, none really stand out from the pack with the exception of Cailee Spaeny’s Amara Namani who is given significant prominence over the rest. The cadets are a diverse group, but they’re not given any depth beyond their nationality and lack personality with several of them seemingly interchangeable from the next. Even Amara seems to be a copy of Mako from the first film: a seemingly undervalued genius who dreams of being a Jaeger pilot but has to confront the demons in her past before she can truly succeed. That’s where the film really falls flat. Even with DeKnight trying make something different with the story, there’s not enough to separate it from del Toro’s film. As the film goes on, a few story beats and moments get repeated, like Amara’s aforementioned character arc or the event horizon of despair before Jack’s rousing speech to the cadets. One area where Uprising both varies and fails from the original is in the visuals. Where the majority of Pacific Rim took place at night, much of Uprising takes place during the day, giving a starkly different visual look to the film. This also gives some of the fights a different style as we get clear looks at the details on the Jaegers and Kaijus. It doesn’t improve upon del Toro’s vibrant and beautiful style, but still holds enough of a candle to it. One scene in particular stands out as Jaegers engage in a fight in the arctic, crashing through ice, water and snow during the sequence. The visuals are also where it fails though, particularly in the fights. By the end of the film, the fights look pretty generic compared to Pacific Rim with the choreography not up to par. Gone are moments like a Jaeger using a ship as a baseball bat or an underwater battle, replaced instead with Jaegers and Kaijus simply throwing each other into buildings. There are some good moments with the Jaegers, but the action doesn’t live up to its potential, not when you have a Jaeger using an electric whip or a very agile ninja-based Jaeger with a pair of laser swords on the playing field. 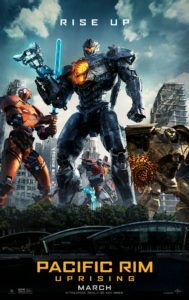 Pacific Rim Uprising is still an enjoyable film. Anyone going just for the robots vs monsters fights will be pleased, though it does take a while for that ball to get rolling and could’ve been more original. DeKnight still directs a competent film with some great visuals and though most of the cast is a bit weak, Boyega makes a fairly strong lead all on his own. Uprising does fail to truly deliver something new and fresh from the original, but its still a good time at the movies.